Location: Hoang Phuong wear on Highway 26, between two adjacent border Khanh Hoa and Dak Lak. Visiting travel destinations in Daklak during your Vietnam Vacations should be unforgetable. Characteristics: mountain range land is a natural lake created titles such as wing Phuong, so named Phuong Hoang. Location: Located on Highway 27 to Dalat, the city center Buon Ma 5km to the east. Characteristics: This is an ideal travel extensively, cool, except with forests and long for convenient organization epidermis, camping, fun for all ages. Location: Lake Lak on routes traffic between the city Buon Ma Thuot and Da Lat, under Lien Son town, Lak District, Dak Lak province, city Buon Ma Thuot about 56km to the south by Highway 27. 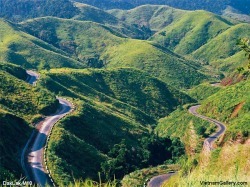 Characteristics: Ho Lak is a beautiful landscape of the Highlands region. Ho has a place to provide more fish, just as they are not huge fresh water supply for hundreds of hectares nuong field, and also for the climate here more than cool. Location: Row Dak Tuar waterfall located near Dak Tuar, center Cu Pui Commune, Krong Bong district, Dak Lak Province on the upper sources about 6km. Characteristics: During the resistance war against the U.S., have Dak Tuar the terrain of Dak Lak province and other units of the main provinces. Location: Waterfall Branch under seven trading N'DRech village, Ea Huar, Buon Don district, Dak Lak province, city Buon Ma Thuot about 35km to the northwest. Features: Waterfall Branch Seven is a beautiful landscape, an ecotourism great Dak Lak province. Location: From the central district of Krong Bong against the sequence Text Yang Sin about 3 km you will see a beautiful landscape of Dak Lak is Krong Kmar waterfall. Characteristics: Originated from the top row of the Text Yang Sin majestic par as the roofs of the Tay Nguyen, the Krong Kmar the drop-down foot of the mountain, creating waterfall bring Krong Kmar look wild, dreaming that one has once here certainly will remember forever. Location: Waterfall Located Thuy Tien Giang Tam, Krong Nang district, Dak Lak province about 7km northeast. Characteristics: Thuy Tien Waterfall is a poetic landscape has been more known. Just like its name, Thuy Tien Waterfall offers a beautiful dreaming getting visitors to the four. Location: National Park Sin Yang Text on boundary between two district Krong Bong and Lak, Dak Lak province, city Buon Ma 60km south to the east. Features: Garden nationalism Yang Sin is not to hide any interesting, attractive to tourists is the research by the uniqueness and richness of natural resources here. Planning a trip to Vietnam? Get the best Vietnam Travel Deals from Viet Vision Travel. Location: National Park Yok Don district Buon Don and Ea Sup district, Dak Lak province, city Buon Ma 40km to the northwest. Features: National Park Yok Don is one of nature's largest country with a total area of 115.545ha.